Beric Dondarrion, also known as the Lightning Lord, arrives at King’s Landing when Ned Stark is appointed as Hand of the King. After the capture of Tyrion Lannister, Gregor Clegane raids the Riverlands looking for Tyrion. Ned Stark appoints Beric as captain of a small party set out to arrest The Mountain. In battle, Beric is killed by The Mountain, though Thoros of Myr is able to bring him back to life. Beric and Thoros form the Brotherhood without Banners and fight for the justice, namely against the Lannisters. They raid many Lannister camps, though all the while, Beric is thought to be dead. 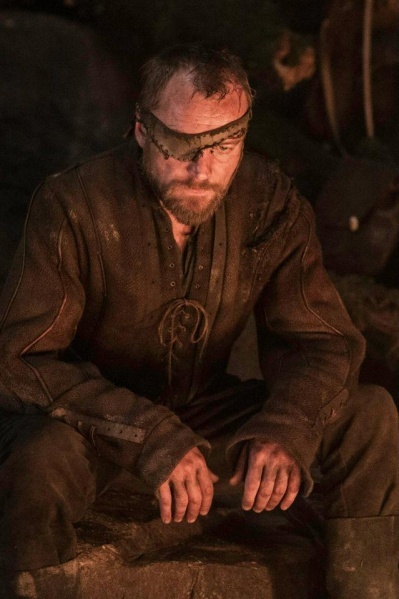 During their battles, Beric is killed several more times, but each time resurrected by Thoros. Though, each time resurrected, Beric loses more of his memory and comes back a weaker man. The Brotherhood without Banners later encounter Arya Stark, who witnesses Beric’s death at the hands of the Hound, during trial by combat. But, once again, Thoros prays to the Lord of Light and resurrects the Lightning Lord. This entry was posted in Characters and tagged beric, beric dondarrion, lightning lord, lord of light, melisandre, the mountain, thoros. Bookmark the permalink.